Successfully Added Electronic Bottle Opener - Food Safe Design, 4x AA Battery, 75dB, Compact Design, Foil Cutter to your Shopping Cart. This electronic bottle opener and foil cutter is the perfect accessory for any wine enthusiast and connoisseur. It has been crafted out of food-grade material which makes it completely safe to use. It is easily powered by four AA batteries (not included) and brings along plenty hours of usage time. The next time you invite over some friends or keeping a house warming party, you’ll be able to open up those bottles with the least amount of effort. When in use, it produces merely 75dB of noise which allows you to open up your wine bottle without experiencing any annoying sound. Additionally, it features a lightweight and compact design. This allows you to easily carry it around to friends or family whenever you’re invited to attend dinner. This cool gadget is the perfect gift for any wine lover out there. 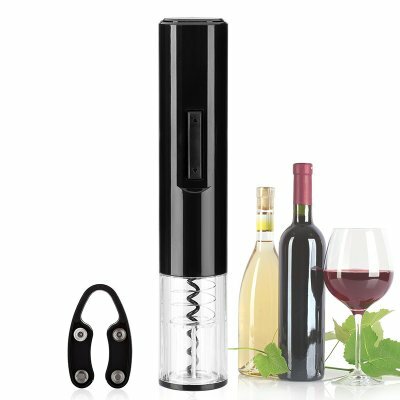 With its stainless steel electric corkscrew, this electronic bottle opener will quickly and easily uncork your bottle with the press of a button. Naturally, the corkscrew can be rotated in both directions, allowing you to easily remove the cork after pulling it from your bottle. This electric bottle opener furthermore comes with a foil cutter that easily allows you to remove the aluminum foil. The next time you’re throwing a family dinner, you’ll be able to open up the wine without any hassle. This electronic bottle opener comes with a 12 months warranty, brought to you by the leader in electronic devices as well as wholesale electronic gadgets..